This is the official discussion topic of the METAL GEAR SURVIVE Trainer and Cheats in the WeMod app. Please post any suggestions, bug reports, or praise that you may have for the cheats in here! hope to see more added. Really did not expect to see this trainer for a while. Just gotta say amazing job and effort to you guys. Keep up the good work!!! The inf ammo works for the bow as well. thirst doesnt go above 29%. 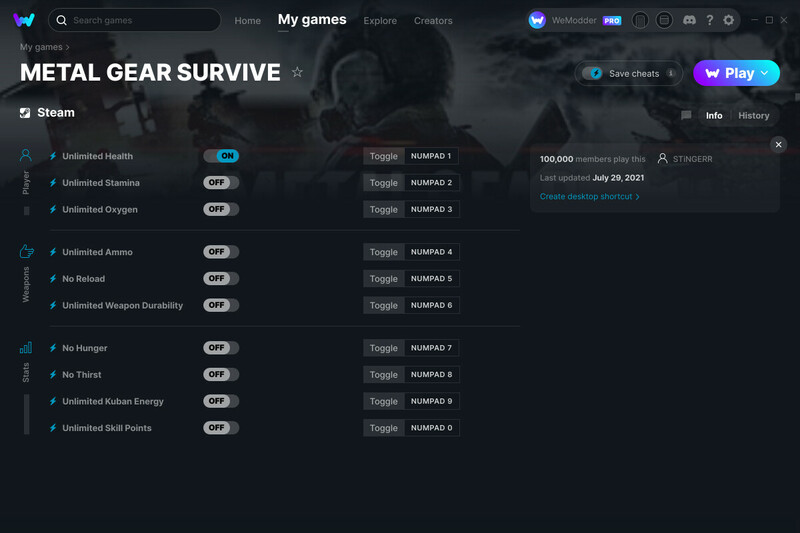 The METAL GEAR SURVIVE cheats have been updated! The stamina mod i acting funny. If you can add a unlimited resources I would say this mod would be the totally awesome and complete. I agree with ctb2002. Everything is great but an unlimited resources cheat would be amazing. nice update… i had to refund my game because it crashes multiple times on my 17 inch alienware laptop… the only game thats crashed for me! With infinite gadgets, it is even better. The weapons still degrade. Even though they are are 100%. Love to see this added. Would love to see infinite resources or something similar. Has anyone been banned by Konami for using this yet? I really want to give it a go to explore the Dust. as long as you use it offline the chance is very slim. Yeah as in the SP only.